Recently, literary critics and some historians have argued that to use the language of separate spheres is to "mistake fiction for reality." However, the tendency in this criticism is to ignore the work of feminist political theorists who argue that a range of ideologies of the public and private consistently work to mask gender inequalities. In Keeping Up Her Geography, Tanya Ann Kenedy argues that these inequalities are shaped by multiple, but interconnected, spatial constructions of the public and private in US culture. Moreover, the early twentieth century when key spatial concepts – the nation, the urban, the regional, and the domestic – were being redefined is a pivotal era for understanding how the public-private binary remains tenaciously central to the defining of gender. 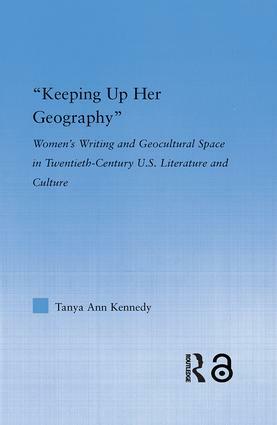 Keeping Up Her Geography shows that this is the case in a range of literary and cultural contexts: in feminist speeches at the World’s Columbian Exposition, in middle-class women’s urban reform texts, in southern writer Ellen Glasgow’s novels, and in the autobiographical narratives of Zora Neale Hurston and Agnes Smedley.